Yiddish and Hebrew journalist; born at Schirwind, East Prussia, March 1, 1848. He studied in Kamenetz-Podolsk and in the Kisbinef Lyceum, and was awarded a diploma by the Imperial University of Odessa for his historical and geographical studies. He chose a commercial career, and, after having held various positions, became manager of a wholesale drug business. In 1887 he emigrated to New York, where he devoted himself to journalism. 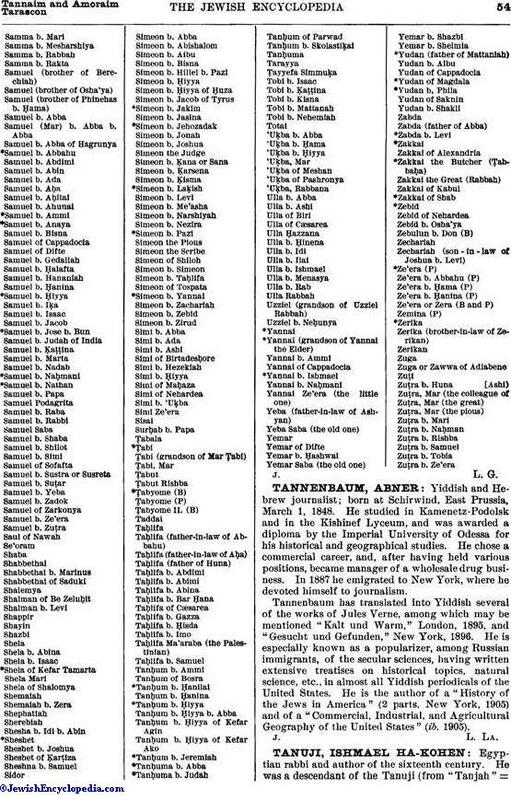 Tannenbaum has translated into Yiddish several of the works of Jules Verne, among which may be mentioned "Kalt und Warm," London, 1895, and "Gesucht und Gefunden," New York, 1896. He is especially known as a popularizer, among Russian immigrants, of the secular sciences, having written extensive treatises on historical topics, natural science, etc., in almost all Yiddish periodicals of the United States. He is the author of a "History of the Jews in America" (2 parts, New York, 1905) and of a "Commercial, Industrial, and Agricultural Geography of the United States" (ib. 1905).